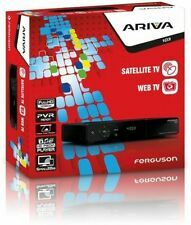 New ModelFerguson Ariva 103 mini Full HD Satellite Receiver. Ariva 103 mini is the smallest, fully functional Full HD receiver with pay TV card reader on the market. This box will allow you to watch Freesat (UK TV) channels with a satellite dish as well as the new RTE digital service SAORVIEW using an UHF aerial. Ariva 103 is the successor to the award-winning predecessor: Ariva 102E model. Recording and playback of programs in Full HD has never been so easy and convenient. This receiver provides picture of the highest quality and a cristal clear sound for all TV programs and Radio stations. FERGUSON - FK7000. DVB FERGUSON FK- 7000 is the successor to the very popular model FK - 6900 CR. The receiver allows election FTA and encrypted with built-in card reader. The receiver is supplied with the advanced microprocessor, thereby ensuring improved performance, for example, fast changing channels. Two tuners on board allow simultaneous viewing of one channel while recording another. Moreover function of multiroom allows you to watch different channels in two rooms without having to invest in smart card splitter device. Recording and playback of programs is easier than ever. Ariva 202E is a unique tuner features such as in the four-LED display, HDMI output, Ethernet interface and USB 2.0 input. Via USB you can play music (mp3, flac, ogg), movies (mkv, avi, xvid) and view photos (JPEG, BMP). Ariva 154 H265 combo is a device to Suit All Your TV Needs. Internet access required via LAN or by conecction or Ferguson W03 Wufi adapter (not included). DVB-T2 Channel Decoder. DVB-S Channel Decoder. FERGUSON Tuner FERGUSON ARIVA 103 (DVB-S, DVB-S2)ARIVA 103 / RTVFEGSTS0020. Trending at $67.97eBay determines this price through a machine learned model of the product's sale prices within the last 90 days. FERGUSON ARIVA 154 COMBO. The decoder is also compatible with the DVB-T2 standard encoded with the H.265 / HEVC codec. - Subtitles: Support for DVB EN300743 and EBU subtitles. - Tuner Type: HALF NIM Tuner. MINI T2 C CABLE / MINI COMBO / AMIKO HD 8840 / MICRO HD SE / AMIKO ALIEN MINI. WO2 150 / 250 / 52E / 102E / 202E /. The improved algorithms allow much better performance as in competitive models. Our dongle is also compatible with the older standards (802.11 b / g). It possible to turn on a 9V output on the RF2 outlet of a Sky box. This power can be used to pass power along with the picture output to a second location. Liczba USB: 2. Zawartość zestawu: Pilot. Rodzaj wtyczki sieciowej: Typ E.
Liczba HDMI: 1. Liczba USB: 2. Zawartość zestawu: Pilot. Rodzaj wtyczki sieciowej: Typ E.
Ferguson ariva 4k. ATENCIÓN : CHAQUE UNITÉ Ferguson ariva 4k NOUS INCLUONS. Gratuit ONU HDMI CABLE V 1.4 PRÊT À SOUTENIR DES RÉSOLUTIONS UHD (4K). 4 K GRATUIT HDMI CÂBLE. Gratuit un câble HDMI v 1.4.